We are pleased to release the 101st edition of the ezine PreSense with the following contents. 1. Cover Story: K Srinivasan, Editor in Chief offers homage to Dr APJ Abdul Kalam recalling later's association with your ezine. 2. 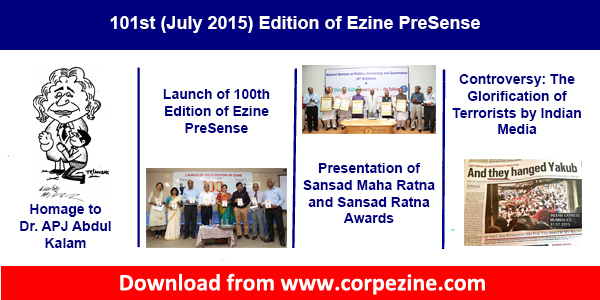 Special Story 1: Susan Koshy, Editor reports about the launch of 100th edition of ezine. 3. Special Story 2: Sukruti Vadula, Editorial Team member brings out a report on Sansad Maha Ratna and Sansad Ratna Awards presentation ceremony. 4. Health: Dr R Jagannathan, Editorial Team member cautions about 'Lead Poisoning; and gives out methods to prevent this. 5. Cartoons : We have two 'Prince' cartoons drawn by Triambak Sharma. We hope you would enjoy this ezine and share with others too.